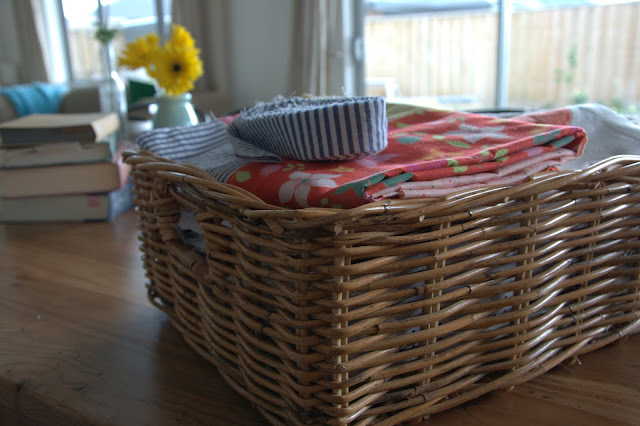 I have a square basket in my wardrobe - it's a place for all the quilt tops I've finished. You see, I have fabric - loads and loads. But batting? Not so much. I'm always telling myself to buy some when it goes on sale, but of course batting isn't high up the list of needs (despite it being quite high up on the wants list) and always daily living, kids activities/fundraisers/school costs* and finishing the house interior and garden come first. This is not a complaint - I have plenty of fabric stash and ideas to keep myself busy making. So the basket is my finished/not finished spot. I'm in no hurry, for the most part I'm just doing this for fun. Occasionally I'll make a a baby quilt for one of my husband's work mates or participate in a swap and then obviously they bypass the finished/not finished spot. Today I thought I would take the basket out and make a little tally of what's in there, because some of these have been waiting a looong time. There are 6 tops waiting, many with pieced backings and bindings all pressed and ready to go; and three sets of blocks waiting for the right sashing or borders or extra blocks before they could rightly be called a finished top. Right at the bottom I found this cross quilt, and all the memories of the time spent making this came flooding back. Why is it some things are imbued with intense meaning, as if each stitch anchors me to a time, a place; and all the feelings I was feeling when I made it? 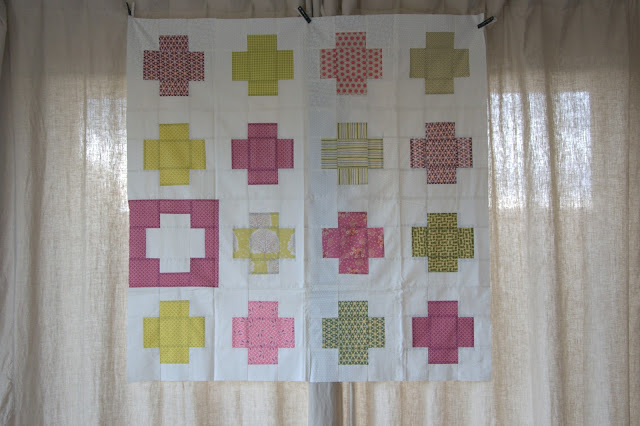 I remembered why I buried it at the bottom - this was the quilt I made as my grandmother lay dying over 18 months ago. She slipped away from us over a period of 10 days. The last thing she asked of us - the only thing we could give her - was dignity and company, so a bunch of us stayed at her bedside 24 hours a day in those last days. Needless to say, it was utterly exhausting on all fronts, but for me its was mostly emotional fatigue. I would come home and sew to disengage from what was unfolding; to try and make sense of it; to try and prepare myself for what would come. 10 days felt like a really long time, and yet not long enough. Anyway this quilt is not really about my grandmother, but it will forever remind me of that last journey with her. I can't live with my sadness at the bottom of a basket in a cupboard, waiting to be discovered and relived...it deserves to be assigned a new meaning. I have plenty of happy memories of my grandmother, but somehow this object can only have the one meaning for me. A new owner can give it a new story. So today I've packed it up and sent it on a journey down to be quilted. I have spent enough time with it and I know I can't bare to quilt it. But when it comes back I'll bind it and then it will be ready for a new life, a new meaning. I think Momma would have approved. *man, is it just me or does this list grow the older your child gets?